Have you ever asked a student to explain his or her answer in math and get a blank look, a quick change in answer, or the response, “I just did it in my head”? To be honest, each year my students pretty much start the school year this way. But, through purposeful instruction, I am able to get even those students with blank looks explaining their answers in complete sentences with math vocabulary by the end of the year. Want to see how I do it? 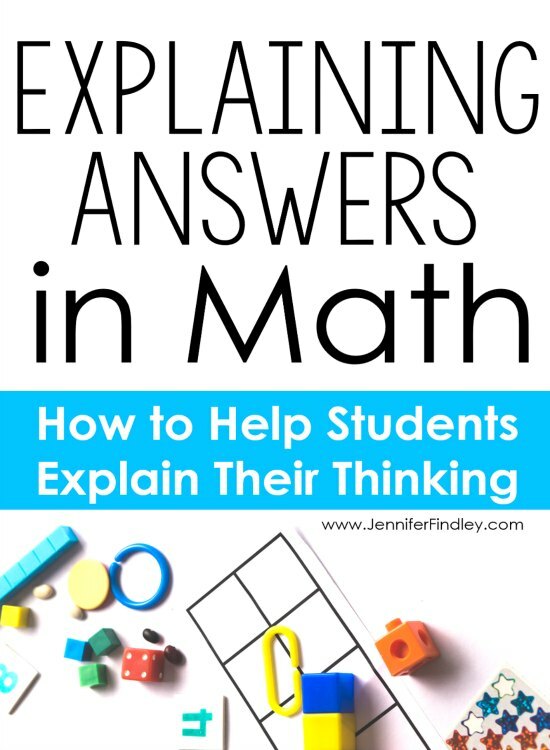 Keep reading for my best tips for getting your students to explain their answers in math. Affiliate links are included in this post, if you wish to purchase the professional development books mentioned. Teacher posts a problem or series of problems on chart paper. Students mentally solve the problem. Teacher calls on students for answers and records all given answers. Teacher calls on students to explain how they got their answers. Students share all strategies they used to get the correct answer, which the teacher records and rephrases as needed. 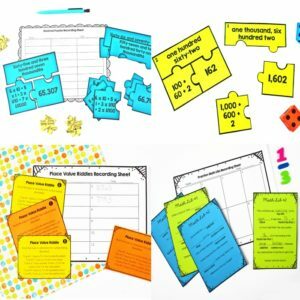 This instructional tool is powerful because the students are regularly explaining how they got their answers, and they are regularly hearing other students’ mathematical thinking and explanations. I have used this strategy in my room for years to help my students think through, solve, and explain word problems. Basically, I pose a word problem or a situation. We read and discuss the problem together, making sure all the students have an access point or entry point (basically a way to begin solving the problem). The students independently solve the problem while I walk around the room creating a sequence to share student work and explanations, which are then projected on a document camera for all the students to see. Seeing and hearing other students’ work, thinking, and explanations greatly benefits all of my students. Further Reading: Click here to read more about this strategy. 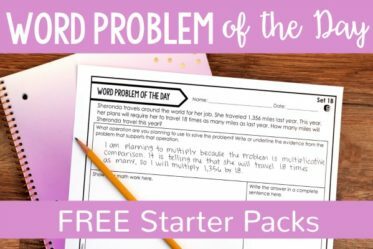 If you need word problems to implement a word problem of the day in your classroom, then click here to see my Word Problem of the Day for 5th grade (4th grade coming soon). Sentence stems are great way to support students, especially those who struggle with explaining their answers or their thinking. Here are my go-to sentence stems for explaining answers in math. 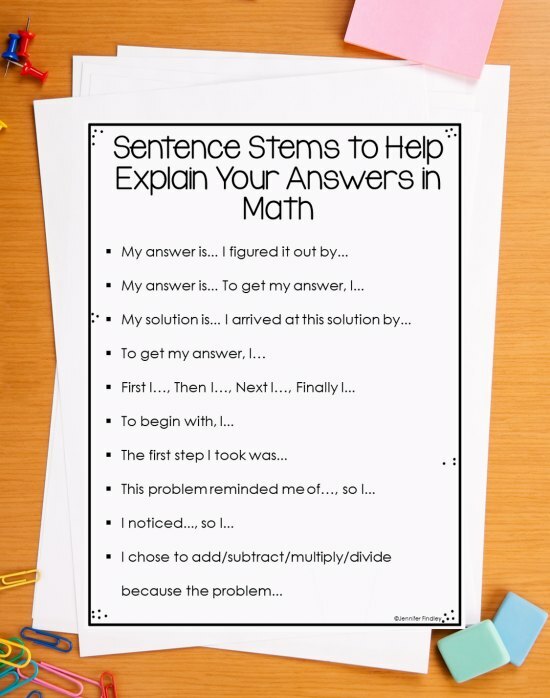 Click here or on the image to download a copy of these sentence stems to help your students explain their math thinking. 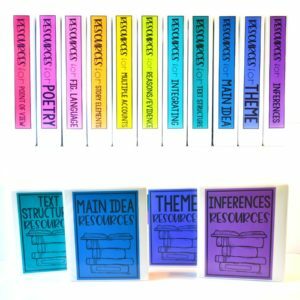 These can be given to the students to be glued in an interactive math notebook as part of a lesson on how to use the stems. 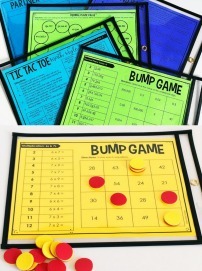 They can also be made into an anchor chart. I also use these two examples when I am introducing the sentence stems and how to use them. One of the examples is explaining an answer to a word problem, and the other is explaining an answer to a computation problem. They are in the same download linked directly above. If students are not talking about how they solved a problem or explaining their work, then chances are that they will not be able to write about it. I use turn-and-talks/think-pair-shares in my classroom daily to get my students talking about math. In my classroom, we share verbally daily and then also write our explanations at least once a week. I use my Interactive Math Word Problems Notebook for this purpose. I have one word problem task for each standard so I am easily able to fit these in each week. The fact that they are housed in our interactive math notebooks makes them a great tool for students to refer back to. 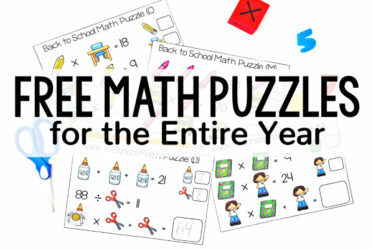 Click here to see the Interactive Math Word Problems that I have in my store. As you are discussing math with your students, regularly model using mathematical vocabulary to explain answers. If they don’t regularly hear the correct mathematical language and vocabulary used, then they will not be able to use it themselves. I think you are saying… Is that correct? So you… and then you… Is that right? Can you tell me again how you ________? Can you repeat how you did this, but try and use the words ___________ and ____________? We use mentor texts all the time in our regular writing instruction, and they work just as well at helping students explain and write in math. Use mentor examples of math explanations to help your students see what you expect and to help them formulate their own explanations. Use released state assessment examples. Share current or previous students’ work (with permission). 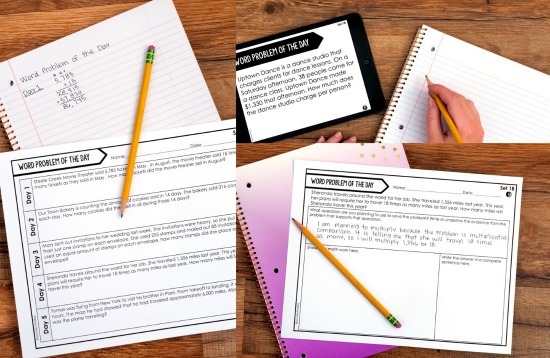 Click here to grab the download for the two mentor examples shared in Tip #3 that show the students how to use the sentence stems. One of the biggest reasons that students cannot explain their work in math is that they don’t have a conceptual understanding of what they are doing. 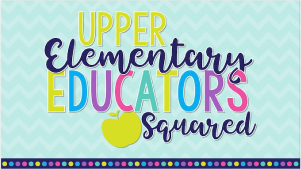 I actually spend quite a bit of my “grade level instruction” time backing up to 4th or even 3rd grade and re-teaching a concept in a conceptual way. I get a bit behind on my pacing occasionally, but am able to speed up later when my students master grade level skills so much quicker. Teaching operations conceptually really helps my students explain their answers because they know exactly why they are adding, subtracting, etc. 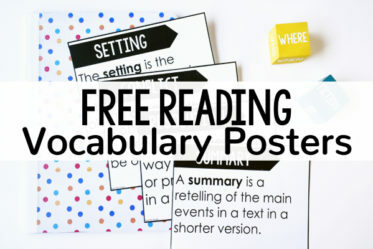 To read more about how I do this with situations versus key words, click here. 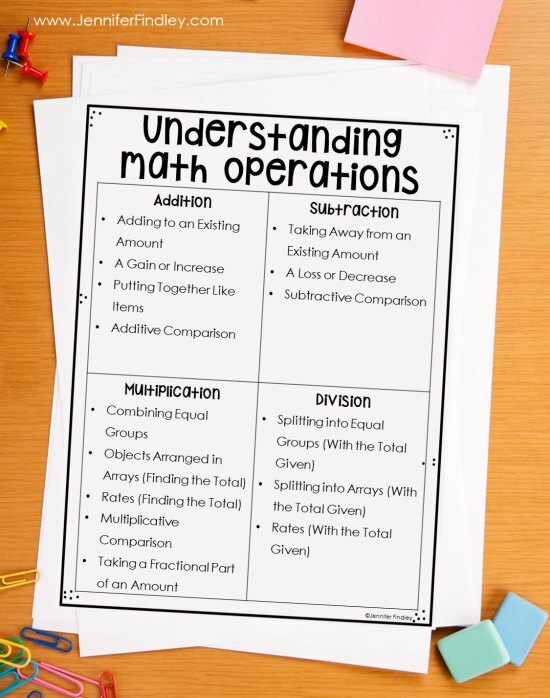 Click here to get a copy of this math poster. There are three versions, and each version increases in variety and complexity. I did have to model this several times before they were able to do it independently. To model it, I would ask the students which one of the phrases best described why they chose that operation. Then, I would have them tell me why that phrase matched. After that, I would model what they said in 1-2 sentences using the context of the word problem and the phrase from the chart. Here is an example: I multiplied because the bags of candy were equal groups. Also, the problem was asking for the total, so I needed to combine the equal groups. The bags were the groups, and the amount of candy in each bag was equal. I have my students practice explaining both computation problems and word problems. I typically start with them explaining how they solved a computation problem and then move into explaining word problems. If they cannot explain the steps they took to solve a computation problem, then explaining how and why they solved a word problem will probably be a huge struggle for them. Another way to scaffold and support students when they are first learning to explain their answers using sophisticated vocabulary and math language is to use partner explanations. Have the partners solve a problem or task together and then work together to explain their answer. You can even give them two different colored pencils or markers to create their written explanations. This would allow you to do a quick check-in to see which partners are providing which information in the final explanation. 11. Ask Guiding Questions: What did you do first? Next? How do you know that your answer is correct? How did you know to do that? What math vocabulary can we include in our explanation? These types of questions will help the student think about their thinking and give them verbal practice with explaining. And remember from tip #4, if the students cannot verbalize their explanations, then they will most likely not be able to write it. 12. 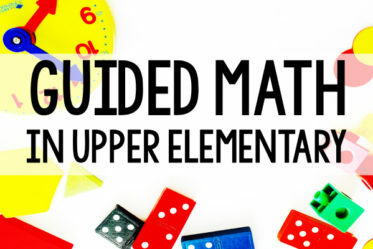 Embed in math centers. An easy way to have your students practicing this is to require them to choose one task or problem they solved to explain. 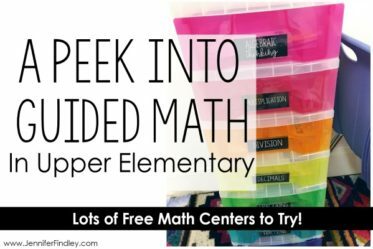 You could do one per math center or one per day. 12. 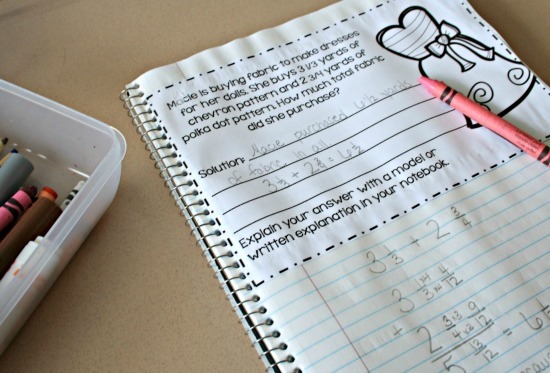 Use mathematical talk regularly in the classroom. 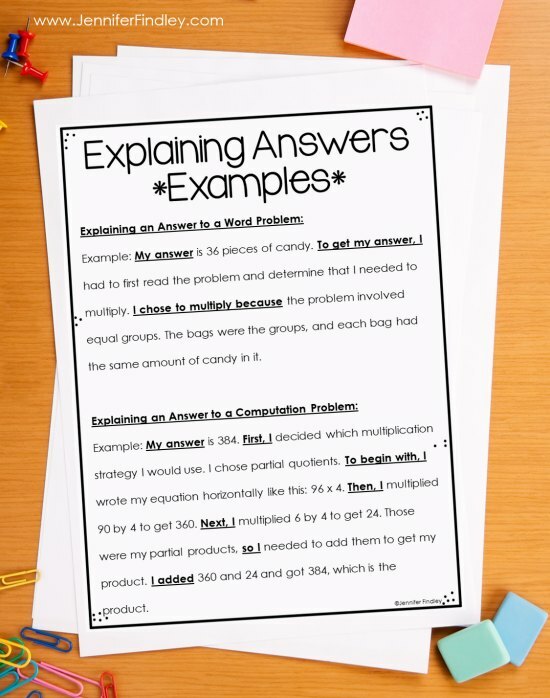 The best way (saved for last) to get your students to be able to explain their answers in math is to regularly be using and promoting math talk in the classroom. I plan to write a new post about this topic in the future, but you check out this further reading suggestion if you are interested in learning about this now. 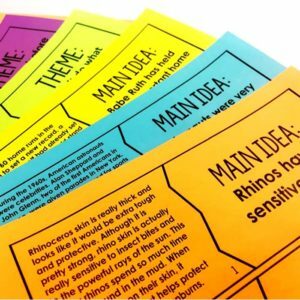 Here are my go-to strategies for helping students go from verbal to written explanations. 1.) As the student is explaining their thinking or their answer, record the main key words they say in a word bank of sorts. Then, restate to the student what you heard them say, and point to each word as you say it. Finally, have them record their thoughts using some or all of the key words you recorded for them. 2.) Sometimes, I do have to back up the complexity of the tasks. If I want my students to really master explaining their answers, then they need to be pretty comfortable with the math they are completing. For many students, working on explaining answers while working on a complex grade level problem may prove too difficult. 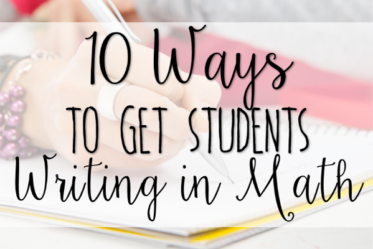 Help them master explaining their answers with review skills first and then transfer that to grade level skills and tasks. I hope these suggestions help your students when they are explaining answers and their mathematical steps and thinking behind those answers. Let me know if you have any questions about any of tips in the comments. Wonderful ideas, thanks for sharing. On the STEM posters, 2nd page, 2nd example, it states “partial quotient” but goes on to example how “partial product” was used. Am I missing something or is this a typo? I have your word problems (the one with half sheet scenario students glue in notebook & complete. I teach 5honors following CCSS.6 but my students still take the 5th Gr PARCC. Your PS is a great review for my students especially for fractions. Thnx again. Definitely a typo. Thanks for letting me know. I have that corrected now. 🙂 And so glad that my word problems are useful to you! Good advice. Also very well develop the ability to structure the thoughts is writing creative papers, for example, essays. But many children in the primary school are very difficult to structure their thoughts. To eliminate this problem, teachers use different methods. This can be written methods or some other creative methods (for example, gaming). 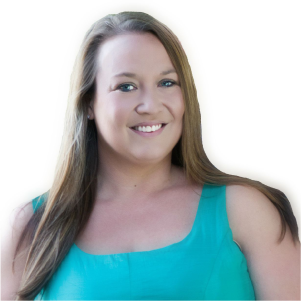 I teach in elementary school and now I am looking for information about different methods of teaching structuring information to students. I would be grateful if you would advise me on quality resources, where I can read some helpful articles. Just now many articles are written for the goal of advertising, and not for the goal of giving useful advice. I would like to know of your opinion. Thank you.